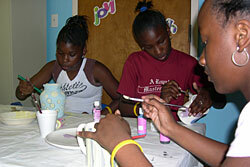 Middle school girls paint pottery after a morning of tutoring in math and English. CHATTANOOGA, Tenn. (UMNS) ? To a casual passerby, the scene might look like an extreme sports exhibition: an enormous slingshot stretched between field stakes, participants cloaked in protective plastic garb, and the cheers and shrieks of the crowd. Twelve kids take turns firing projectiles of paint at oversized canvases, creating a colorful masterpiece worthy of a gallery, and noise reminiscent of a football game. But what is taking place in a field behind Christ United Methodist Church is far more significant than a casual competition. Children from Chattanooga?s inner city are experiencing the thrill of seeing their own artistic talent make an impact. ?It makes me feel special, and that I can do a good job and make things happen in my life,? says rising seventh-grader Sierra Daniels. The enormous slingshot, paint-soaked tennis balls, and happy faces are the kids? payoff for voluntarily spending summer mornings hitting the books, as part of a program aimed at raising the academic performance of children in the inner city. ?These kids will remember how much fun it is creating the art,? says Becky Hall, Christ Church director of missions. ?They remember how rewarding it is to create something beautiful, and that is an insurance policy that they will return to our literacy program next year.? 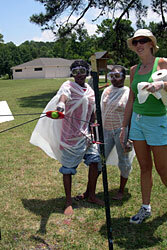 A child launches a paint-covered tennis ball at a canvas across the field as Jenny Smith supervises. Two dozen women prep canvases, soak paintballs and instruct pottery embellishment. The women, who call themselves Moms on a Mission, use the extreme art in tandem with the academic instruction offered at the Bethlehem Center, a United Methodist neighborhood center in the inner city. The art and other enrichment activities are a lure to keep middle-school students involved in the academic tutoring program during the lazy days of summer. ?Our students have scored below grade level during their academic year,? explains the Rev. Lurone Jennings, Bethlehem Center executive director. ?They must have intensive work in both language arts and mathematics if they are to reach their full potential in high school. We must reach them now. The problem is that there are a lot of distractions and reasons not to come to get the help they need.? Enter Moms on a Mission and extreme art classes. Several professional artists count themselves among the group of moms. They lend their talents to a number of diverse artistic expressions that draw the students? attention and fire their collective imagination. ?Today, I had a group of boys who were very apprehensive about coming out here to paint because they think that?s a girl thing,? says professional painter Jane Newman. ?Once they got started, they simply got lost in the beauty and freedom of the art process.? In the three years since the program?s inception, students have had opportunities to create oil paintings, in both abstract and representational styles. One boy says painting taught him new things about himself. ?It makes me feel good,? says Jeremy Davis, a rising ninth-grader. ?I didn?t know I could paint. I know Miss Jane has faith in me.? 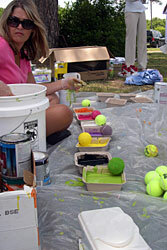 Sue Moore, one of two dozen Moms on a Mission, prepares the tennis balls used to create slingshot art. The moms say they have learned alongside the kids and have gained insight into the purpose in their own lives. ?I think it?s our mission. God gives each one of us a gift, and we?re supposed to use it,? Newman says. ?I need to share my gift.? Jenny Smith says exploring the creative process with the middle-school students reinforces her belief that faith takes action. ?I think it is very important that we show other mothers and parts of our community that all children are important, and every child deserves an opportunity. We have to give children new experiences so they can truly grow.? In all, more than 100 pieces of art are created in the program. Some of the canvasses span three or four feet, and some are glazed ceramic. At the end of the summer, the art will be auctioned and the proceeds will help fund the tutoring and academic support for next summer. ?One of the best parts of this program is that the students have some ownership in it,? Jennings says. ?Their work impacts the program.? The art is already in high demand. A local BMW dealership says it plans to purchase and hang some of the art in its new showroom. ?It?s quality work. They put all their effort into it,? says Leslie Williams, BMW of Chattanooga. ?I think it?s fresh inspiration for us to purchase this and put it up in our new facility, rather than purchase elsewhere.? The combination of art and academics appears to be a master stroke. Tutors report that by the summer?s end, they see a 28 percent increase in the number of students who can pass a grade-level reading test. This means the students start this school year with a firm grasp of the scholastic, and also a confidence in their God-given talents. Jeremy Davis sums up the feeling of the young artists: ?I did a very good job.? *Robinson is a freelance producer based near Cleveland, Tenn.